11 years, over 1,000 games, and over 3,700 at-bats. If Blake Gailen hasn’t seen it, done it or experienced it, I’d be very surprised. 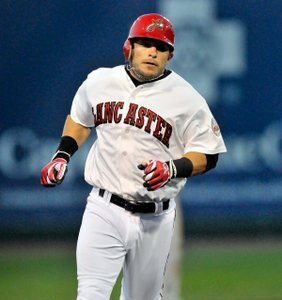 The Atlantic League’s Lancaster Barnstormers announced that Gailen has signed a minor league deal with the Los Angeles Dodgers, making this the fifth time he’s signed a contract with a MLB organization and third time within the state of California (LA Angels 2011/2015). Incredible! In 2012, Gailen produced one of the greatest Indy seasons we’ve ever seen, ranking up there with Daniel Nava’s 2004 campaign with the Chico Outlaws of the Golden League. As an undrafted free agent out of UNLV, Gailen put together numbers that rival the best Playstation stats; .338/.415/.534, with 26 doubles, three triples, 22 home runs, 89 RBI, and 25 stolen bases. Those numbers translated into a trifecta of accolades; voted the team’s’ MVP by the fans, earned the Atlantic League MVP award and Baseball America’s Independent Player of the Year. In his previous stints in the minors, he really hasn’t put up the numbers we are accustomed too, but that’s where the disconnect is. In 114 minor league games, Gailen’s hit .229 with 13 home runs and 64 RBI. In 11 Indy seasons, the numbers are substantially different; .328/.416/.513 coupled with 97 home runs and 438 RBI in 791 games. Every single time Gailen gets to play a full season, he produces. There’s no question about that. His stint with the Arkansas Travelers in 2015 was the only occasion he saw significant playing time with an MLB affiliate (76 games), not nearly enough to say he can’t play at that level. When Gailen was spotted by the Toronto Blue Jays in August of 2013, he was in the midst of another great season and good enough that the Jays assigned him to Triple A Buffalo where he hit .286. There’s nothing different about 2017. Gailen is still crushing the baseball and making believers out of all the naysayers. He even collected his 500th hit with the Barnstormers this June. After posting some of the best numbers of his career at age 32 (.323/.408/.521), it’s no wonder the Dodgers scooped him up. Barnstormers manager Ross Peeples couldn’t be more thrilled for the Gailen who departs as the team’s all-time leader in hits (524), runs (309), homers (72) and doubles (108). And according to a Barnstormer’s press release, his final home run tied him with Jutt Hileman as the team’s career RBI leader with 273.